The second half of the Twentieth century is characterized with great progress in science and technique. Progress in science and technique in Russia is coincided with changes in man’s life and with reforms of Russian society. Ideas of these reforms are especially actual for such a field of man’s activity as science. This book might be considered as development and application to another A. Leschenko’s book — “Building mechanics of thin-walled constructions” (USSR, Moscow, ‘Strojizdat’, 1989), in which the new conceptions of strength, stability and dynamics of thin-walled constructions have been discussed. The detail and deep theoretical analysis of building mechanics theory, on which the modern methods of thin-walled constructions are based, has allowed to the author to open the contradictions in modern conceptions of strength, stability and dynamics of thin-walled constructions. It has been shown their interactions in laws of physics and mechanics. These models of interactions have allowed to show all contradictions in modern theories of strength, stability and dynamics of thin-walled constructions and to formulate the main law of cross-section method (principle of pairing of force factors). At any cross-section loaded of elastic body being under load there are always two force factors: 1) external force factor which is the sum of projections (or moments) of all external forces of the cut off part of elastic body and 2) internal force factor (integral characteristics), which, due to condition of equilibrium of the cut off part, equals to external force factor and acts in opposite direction. Ignoring this principle violates the main laws of mechanics (see triads). The developed new adequate theoretical models of strength, stability and dynamics of the thin-walled constructions considerably specify physics of the phenomena and simplify designing. Experimental proving of new ideas as the main criteria of truth has been discussed a lot in the book. The development of the new branches of technique such as cosmonautics, missile manufacturing, researching hydrosphere depths with the help of deepwater apparatus, etc. makes engineers and designers to solve more and more complicated problems concerning evaluation of constructions for strength, stability and dynamics. The main goal of this book is to help the practical engineers in solution such problems. The book consists of 7 chapters. In chapter I the analysis of current conception of the strength of elastic systems, its consistency harmony with Lagrange–Castigliano’s principles and variation mechanics principles have been discussed. Here the analysis of contradictions in the current theory of thin-walled bars are paid attention to. In Chapter II the earlier unknown law of dividing torsional strain is introduced in the strength theory and on its base according to variation mechanics principles the new conception of thin-walled construction strength is being developed. In Chapter III the solution methods of various engineering problems of strength evaluation of beams and bars are developed according to methods suggested by the author. The Chapter IV is devoted to the experimental proving of the law of dividing torsional strains law. The new strength conceptions are proved on the base of experiments of designing J-beam bending center and fibre strains of beams and bars. In Chapter V the detail analysis of the elastic system conception is given, the current conception is corrected and conclusions are made. Chapter VI is devoted to the development of new conception of bending thin plates and slanting cylindrical shells. Here Karman’s conception of bending plates in details, is discussed its contradictions with mechanics laws are shown and the new approach to solution of the problem of bending plates and shell is proved. In Chapter VII mechatronic units and their using in analyzing strength of J-beams are discribed. The analysis of corrections says that the using of scientific results introduced in the book in to practice of designing and building means the reform of the whole science of structural mechanics. Prof. Alexander Petrovich Leschenko was born in 1939. He has got PhD degree in Civil Engineering. 2) Patent N 542435 of 21.09.1978 on invention Breakdown controller of pile driver. His current research concerns various aspects of Civil Engeneering and Structural Mechanics. 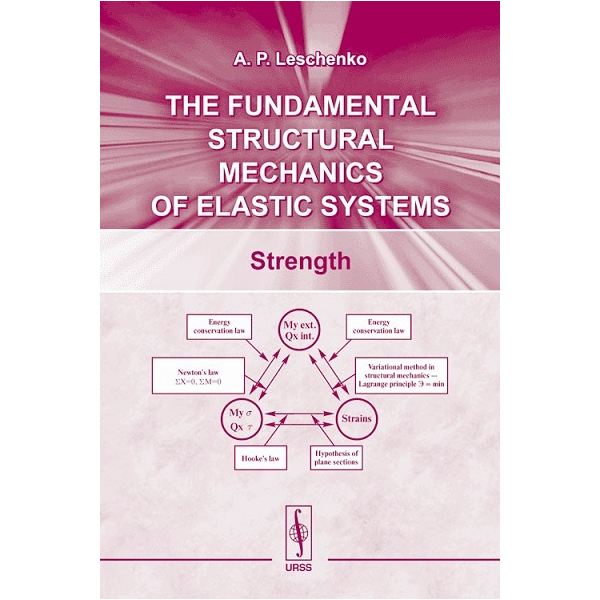 — Fundamental structural mechanics of elastic systems (in Russian), Taganrog, Sphinx, 2003.